Was Arcimboldo the first surrealist? The answer is "no" based on the show at the Palazzo Barberini which paints him as an ecumenical Renaissance man. Milanese of birth, Arcimboldo became the “painter of the court” in 1562 for Maximillian who had become Holy Roman Emperor. However, the inception of his work was more a product of the humanistic spirit of discovery in which the bizarre and grotesque constituted the panoply of mankind’s condition. Both the spirit of Leonardo and of course the discovery of the New World influenced the famous “composite heads” made of fruits, or illustrating verdant nature in “The Four Seasons.” “The Platter of Roast Meats” is one of the so-called “Reversible Heads.” Depending on which way you look at it, it’s either the chef's pate or the dish he’s serving. Fans of the contemporary artist Georg Baselitz, who paints the bottom on top, will experience the shock of recognition. And then there are the “teste caricale” also known as the “pittore ridicule” like “The Jurist” which shows a lawyer’s collar made of documents or “The Librarian,” with its torso composed of books. 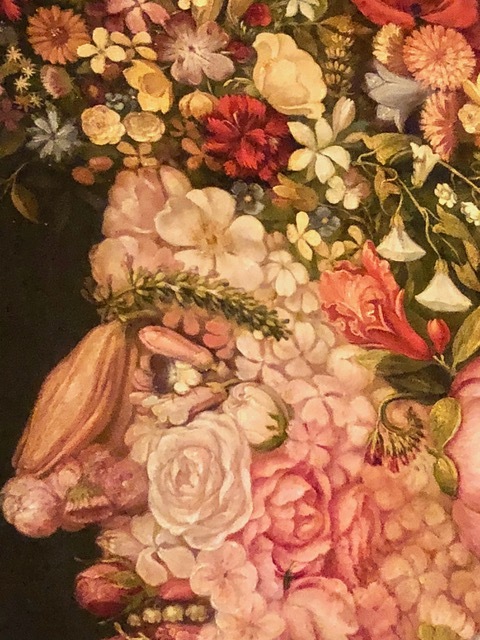 One can imagine a painter like Dali delighting in his discovery of Arcimboldo, but the sensibility is based less on incongruity than an almost irrepressible exultation in the all that is human.